The Chikungunya IgG/IgM Rapid Test is a lateral flow chromatographic immunoassay for the qualitative detection of IgG and IgM anti-chikungunya virus (CHIK) in human whole blood, serum or plasma. It is intended to be used as a screening test and as an aid in the diagnosis of infection with CHIK. Any reactive specimen with the Chikungunya IgG/IgM Rapid Test must be confirmed with alternative testing method(s) and clinical findings. Chikungunya is a rare viral infection transmitted by the bite of an infected Aedes aegypti mosquito. It is characterized by a rash, fever, and severe joint pain (arthralgias) that usually lasts for three to seven days. The name is derived from the Makonde word meaning "that which bends up" in reference to the stooped posture developed as a result of the arthritic symptoms of the disease. It occurs during the rainy season in tropical areas of the world, primarily in Africa, South-East Asia, southern India and Pakistan1-2. The symptoms are most often clinically indistinguishable form those observed in dengue fever. Indeed, dual infection of dengue and chikungunya has been reported in India3. Unlike dengue, hemorrhagic manifestations are relatively rare and most often the disease is a self limiting febrile illness. Therefore it is very important to clinically distinguish dengue from CHIK infection. CHIK is diagnosed based on serological analysis and viral isolation in mice or tissue culture. An IgM immunoassay is the most practical lab test method4. 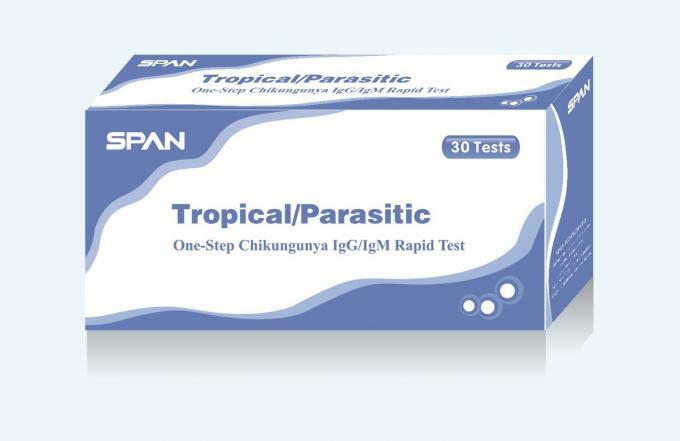 The Chikungunya IgG/IgM Rapid Test utilizes recombinant antigens derived from its structure protein5, it detects IgM anti-CHIK in patient serum or plasma within 15 minutes. The test can be performed by untrained or minimally skilled personnel, without cumbersome laboratory equipment. The Chikungunya IgG/IgM Rapid Test is a lateral flow chromatographic immunoassay based on the principle of the IgM capture assay. The test cassette consists of: 1) a burgundy colored conjugate pad containing CHIK antigens conjugated with colloid gold (CHIK conjugates) and rabbit IgG-gold conjugates, 2) a nitrocellulose membrane strip containing a test band (T1 or T2 band) and a control band (C band). The T band is pre-coated with anti-human M antibody, and the C band is pre-coated with goat anti-rabbit IgG. When an adequate volume of test specimen is dispensed into the sample well of the cassette, the specimen migrates by capillary action across the cassette. The IgM antibody to CHIK, if present in the specimen will bind to the CHIK conjugates. The immunocomplex is then captured on the membrane by the pre-coated anti-human IgM antibody, forming a burgundy colored T band, indicating a CHIK IgM positive test result. · For professional in vitro diagnostic use only. · Do not use after expiration date indicated on the package. Do not use the test if its foil pouch is damaged. Do not reuse tests. · This kit contains products of animal origin. Certified knowledge of the origin and/or sanitary state of the animals does not totally guarantee the absence of transmissible pathogenic agents. It is therefore, recommended that these products be treated as potentially infectious, and handled observing the usual safety precautions (do not ingest or inhale). · Avoid cross-contamination of specimens by using a new specimen collection container for each specimen obtained. · Read the entire procedure carefully prior to performing any tests. · Do not eat, drink or smoke in the area where the specimens and kits are handled. Handle all specimens as if they contain infectious agents. Observe established precautions against microbiological hazards throughout the procedure and follow the standard procedures for proper disposal of specimens. Wear protective clothing such as laboratory coats, disposable gloves and eye protection when specimens are assayed. · Buffered Saline contains sodium azide which may react with lead or copper plumbing to form potentially explosive metal azides. When disposing of buffered saline or extracted samples, always flush with copious quantities of water to prevent azide build up. · Do not interchange or mix reagents from different lots. · Humidity and temperature can adversely affect results. · The used testing materials should be discarded in accordance with local, state and/or federal regulations.